I died a plant and arose an animal. I died an animal and I was a woman. I shall become that which no mind ever conceived. There is a great deal of evidence which supports the belief...the awareness that there is no death and that it is a transition ....a rebirth into a new life...a higher life in another place outside of time and space as we understand it. Here we will explore the nature of life and the afterlife. We will examine some of the evidence that supports the belief...the understanding that there is no death and that we are eternal. The evidence is not only found in spiritual writings and explorations but is also supported by our new science. Journey with us as we share some of the research that will give you a new way of viewing yourself and the nature of life and death. We live in a physical world, when we die where do we go? What happens? Rev Barry offers a spiritually uplifting perspective on life after life. He shares his deep knowing that your loved ones are connected to you, whether they are here or on the Spirit side. Over the years, I have discovered that the topic of death and dying is often dealt with in whispers and discomfort and in many cases is avoided altogether. The thought of death creates fear in us not because we understand it but because we don't. The truth is we actually don't understand what alive is either in many way even though we are it and we kind of accept that. But death.....We do not feel we really know what happens to the soul when we die so we fear it. It is part of life and yet it is unknown to us because we cannot imagine the absence of life so how can we understand death. It is an unknown to us and that frightens us because we have learned to be afraid of things that we do not understand. If we look at the beliefs of what the afterlife beyond this life is like, there is certainly some uncertainty and confusion. And why should this surprise us? When we try and understand death, we are trying to understand something that is inconceivable to us....alien actually. How can we hope to understand somethings that is un-life? How can we embrace non-existence. Humanity over the centuries has worked very hard to come up with ways to understand the world beyond the physical world and spiritual life and has struggled to develop concept of what happens when we die. Sometimes these beliefs and understandings have evolved into religions and traditions which reflect the peoples, the cultures and the times that they were developed in. Sometimes .... often.... these beliefs have been associated with fear arising out of the assumption that there is a right way and a wrong way to live and if we fail somehow we will be punished in the next life. This misrepresentation of the consequences and nature of life and death is one of the reasons we are fearful of the concept of death. The truth is there is no death. I have been blessed with the certain knowledge of this. Over my life time I have experienced and seen a great deal of sound evidence to support the belief the death that we fear is merely a transition .... a rebirth ...into a higher life. If we are Spirit, which is what I believe that we are, then how can we hope to understand our true nature as Spirit while choosing to live a life in a physical body and forgetting our true nature. We have chosen this life of limitations and we have forgotten that we cannot fail and cannot die so that we experience challenge to learn and to grow through. Life if purposeful....and a meaningful life arises out of free-will - the power of choice. Rev Barry King explores two basic truths for those of us living a life in the physical. The first is that we are Spirit choosing to live a physical life and the second is that life is by nature purposeful and that we move through it through the power of choice. So if you accept that you are not physical and that you are Spirit then death looses its power. The fear of death looses its bite because we cannot die. As eternal, infinite, incomprehensible Spirit greater than you can ever begin to imagine you are connected to Divine Mind - the Source of all and to each other. We have chosen the illusion of the physical life of limitation that we are living so that we can experience and develop an understanding of challenge without the certainty that we cannot fail and that we cannot die. Rev Barry note that the fact that Readings which connect us to our loved ones in the heaven world is a validation of the reality that we are spirit and that we do not die. Rev. Barry talks about the nature of sharing messages from the spirit side and shares some previous message and experiences he has had working with spirit. Reading and mediumship is a validation of the fact that we can connect to the people we love on the Spirit-side. Crystal from Saint John, NB discusses how her reading was and what she received from it. ​There are many who have had Out-of-Body Experience which have convinced them that they are Spirit and that when we die we visit another place and continue to evolve and grow. Some have died and returned and some have experience trauma which has caused the experience. No mater what the cause, these experiences are life changing and are often not shared because of fear of ridicule. "A Simple Guide to the Afterlife"
Advocates of reincarnation indicate that the Bible supports this belief. In John 9: 1-3, we read, "As he passed by, he saw a man blind from his birth. And his disciples asked him, 'Rabbi, who sinned, this man or his parents, that he was born blind?' Jesus answered, 'It was not that this man sinned, or his parents, but that the works of God might be made manifest in him..." In Matthew 17: 11-13 we find , "He replied, 'Elijah does come, and he is to restore all things; but I tell you that Elijah has already come, and they did not know him, but did to him whatever they pleased. So also the Son of man will suffer at their hands.' Then the disciples understood that he as speaking of John the Baptist." What is your spiritual practice and how do you approach your spiritual life? How do you believe in God? Barry discusses the nature of spiritual life and Divine Mind and its power in our lives. ​The Excerpt Below is from my book ​​"Many Paths, One Truth: An Affirmation of Spirit." When I was very young (about 11 or 12), I wrote a poem. Amazingly, I still remember it. It was titled, “Death” and I would like to share it with you. But pondered by us all. For all men have to fall. The Silver cord is severed. The soul is free at last. Man’s soul can feel no past. Today, I feel differently about this question and the answer. I know with absolute certainty that there is no death. The physical body does indeed die, but the soul, however, is eternal and continues forever. The death of the physical body is like the opening of a door. Through this door you step from this world into the next. Not only does your memory and the essence of the individual remain intact, but in time you will regain the memories which were lost in the transition into the physical. The evidence to support this is experiential. I have been given a gift, which allows me the opportunity to communicate with and see those on the other side of the door we know as death. I have had many proofs of the existence of a life beyond this life. My answers today come from personal experience and confirmations of those experiences I have had while I have been here in the physical. I have been blessed with the opportunity to do tens of thousands of readings over the years. Each reading brings me a new confirmation to the reality of Spirit realms and of the absolute truth of our continued existence and awareness after the change called death. Below are a few examples of experiences I have had with people who have come to see me. It is important to remember that for the most part these experiences are spontaneous and that I do not know the people or why they have come to see me. One night we were doing a meditation and development group when the father of one of the participants arrived and had a message he wanted to share with his daughter. The man was in Spirit and had been there for a number of years. The daughter wanting some confirmation that this was indeed her father asked how he had died. The man told me that he had died after he had fallen down the stairs. This was early in my career of working with those in Spirit and for some reason, I did not believe him. I told the father that he would have to give me another answer. Somewhat surprised, the Spirit said, “Well, you can tell her that I had a heart attack.” I shared this answer with the woman. She looked puzzled and said to me, “I suppose that could be the reason why he fell down the stairs.” I learned an important lesson that night. I had robbed this woman of her proof. I had not trusted the message I had received. A year or so ago, I was doing a message circle with 11 people from a local community who had each lost someone for whom they were grieving. Even though I did not know whom they had lost or the circumstances, each received a message from the person that they were hoping to connect with. For example, when I connected to one lady - Joanne, a young woman appeared. I described the young woman to Joanne. She was showing me her pierced ears which had two piercings in each and wanted me to tell Joanne that she was fine and that she was not upset with her. She was happy and comfortable on the Spirit-side and wanted Joanne to stop feeling guilty and to know that she loved her. The message continued for a while and the woman was clearly moved and tearful. After the young woman from Spirit had left, Joanne explained that this had been her daughter and that she had died in a car accident about six months previously. The evening that she had died she had come home with her ears pierced with two piercings in each ear and they had argued about it and her daughter had left the house angry. That was the last time she had seen her alive. She had been haunted by the fact that her last words had been ones of anger and that she had not told her daughter that she had loved her when she left the house that last time. On the Spirit-side, we can do the things we enjoyed in life. A woman came to see me in my office a few weeks ago. She was clearly troubled and when I connected to her, her husband who had made his transition recently into the Heaven World showed up. He was quite a character and quite a pleasant fellow. I said to the woman that he must have loved horses. I could see him watching horse races. She said laughing, "That would be him. He loved the races and raised horses on the farm." I said to her that he was also showing me a deck of cards and seemed to be playing cards with a group of friends. Again she laughed saying, "The only thing he loved more than horses was playing cards." The session went on for about 40 minutes. I could see a great weight taken off her as she left knowing that her husband was alive and well in Spirit. For me, there is certainty that we are eternal and that there is no death. In the Bible, we read of the two bodies - the physical and the spiritual; the mortal and the immortal. So will it be with the resurrection of the dead. The body that is sown is perishable; it is sown in dishonour, it is raised in glory; it is sown in weakness, it is raised in power. It is sown a natural body; it is raised a Spiritual body. If there is a natural body, there is also a Spiritual body. Listen, I tell you a mystery: We will not all sleep but we will all be changed - in a flash, in a twinkling of an eye, at the last trumpet. For the trumpet will sound, the dead will be raised imperishable, and we will be changed. For the perishable must clothe itself with the imperishable, and the mortal with immortality. "Where O death, is your victory? Where O death is your sting?" Psychics, shaman, and Spiritualists have always known of the two bodies - the physical and the etheric - the mortal body and the soul. ​It is difficult sometimes, immersed in a physical body, to recognize that we are Spiritual beings. It is not that you have a soul; it is that you are a soul. You are eternal and you are of God. 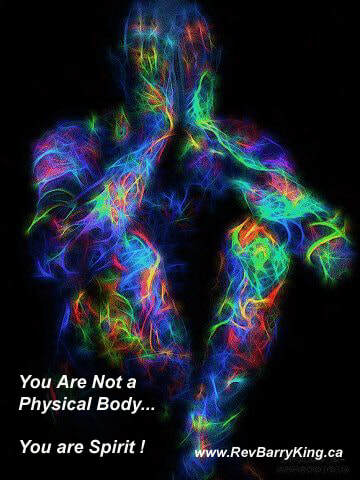 Your physical body is merely the container in which you have housed yourself for this lifetime on earth. It is also difficult for us sometimes to understand how it works. How can the physical and Spirit realms interpenetrate each other? How can a Spirit body take up residence in a physical body? Imagine for a moment that our states of existence are like water. Water molecules at different rates of vibration create water in different forms. When the molecules are vibrating slowly, they create ice. When the water molecules are vibrating very fast, they create water vapour. Between these two, we have liquid water which is an intermediary. Our physical world has a slow vibration and can be likened to ice. It is not easily malleable. It is heavy and sometimes difficult to work with. Ice cannot penetrate ice because it shares a common vibration. This is the physical world. Our Spiritual bodies have a very fast vibration and can be likened to water vapour. They are light, intangible, energetic, and malleable. This is the nature of Spirit and the Spirit realms. The Spirit realm and Spirit cannot be seen from the physical because as with water vapour in the air, it is light and intangible. Spirit can interpenetrate the physical because it is made of finer materials just as water can hold water vapour before cold slows its vibration down to form ice. It is also true that, to continue this analogy, we must look at water and how Spirit can slow their vibration or we can learn to speed ours up to communicate. The lower realms of the Spirit world can be likened more to water. As the vibration of Spirit speeds up, it becomes less accessible to those below. This is true for those in Spirit, for there are many levels as we move closer to perfection. I would also note that it is much easier for those above to slow their vibration down to speak to those in the lower realms than for those in the lower realms to raise theirs. So the Spirit body penetrates and is held within the physical body. The Spirit is not trapped but it is attached for this physical life that the soul has chosen by a silver cord. Upon death this cord is severed. There are many reports of sensitives seeing the separation of the physical body from the Spirit body and the breaking of the silver cord. Another proof that we can look to for support of the idea of two bodies and eternal life are “out -of-body experiences” and “near-death experiences.” These occur when the physical body is separated from the etheric but the silver cord continues to connect you. Out-of-body experiences happen more than you might think. Every night while your physical body sleeps, you are able to enter the astral world - the Spirit realms to learn, explore and visit loved ones. Often we do not remember these excursions. There are many instances where people have found themselves looking down at their sleeping body connected by the silver cord. Sometimes this can be quite frightening, because they do not understand the experience and do not know how they will get back into the body. There is little for them to fear. This is a normal state to be in and it is called astral projection. Once they get over the shock of the experience, they can choose to return easily and comfortably. If they remain in a state of panic, any loud noise or an alarm will snap them back into the body. World only to be stopped and told that it is not time yet. No matter what science tells you, these experiences are real. Science has an important stake in these experiences not being true. If they are true, then it changes the nature of the world scientists understand. It has been my experience over the last 20 years that many more people have had life changing experiences with those from the Spirit realm than who would like to admit it. There is a social stigma associated with these types of experiences and most tend to keep them to themselves rather than have to bear the scrutiny and disbelief of those around them. You who have had such experiences are not alone. The more people who come forward with their stories the more we validate the experiences of others who have not shared theirs. To the Spiritualist there are many proofs to a life after death. We have only explored a few here. Each of us must deal with the death of the physical body in our own way. There is much evidence and for many of us, certain proof, that we are eternal, and that a brighter world of love and light awaits us. We are both the caterpillar and the butterfly. Join Rev Barry on a meditative excursion to the Heaven World where you can feel peace and serenity as you connect to spiritual guidance.